SonoScape S2, S6 and S8 are full function hand carried Color Doppler systems that can be widely used in clinical practice. The products are developed to satisfy all the basic clinical requirements as Radiology, Cardiology, OB/GYN, Vascular and Small parts. The ultrasonic examination of the liver is a relatively high informative method. The doctor evaluates the dimensions of the liver, its structure and homogeneity, local disturbances as well as the blood flow condition. The ultrasonic examination allows detection of both diffusive changes in the liver (liver steatosis, chronic active liver disease, cirrhosis) and local (fluid formalities and tumor mass). Besides the liver itself, the state of the gall bladder and bile passages is also examined: their dimensions, the thickness of the paries, patency, the presence of concrements, the state of the connective tissue. In most cases the ultrasonic examination allows to detect the concrements in the gall. During the examination of the pancreatic gland the doctors can evaluate its dimensions, form, boundaries, homogeneity of parenchyma, the presence of formalities. During the examination of the kidney the doctors evaluate their number, arrangement, dimensions, form, boundaries, structure of parenchyma and pelvicalyceal system. The ultrasonic examination can be used for detection of the indication of intestinal obstruction and indirect indication of adhesive process. With the help of ultrasonic examination the doctor can detect the presence of free liquid in the abdominal cavity (if it is in a great number) that can play an important role in the treatment policy of a number of therapeutic and surgical disorders and injuries. The ultrasonic examination is the crucial in the examination of the thyroid gland because it allows to detect the presence of ganglions, hydatids, the changes in the dimensions and structure. 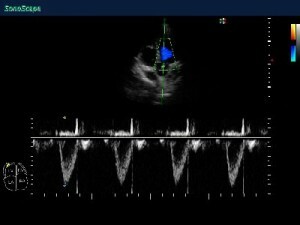 Echocardiography is the ultrasonic diagnostics of the heart diseases. This examination evaluates the dimensions of the heart and its particular structures (ventricle of the heart, auricle, ventricular septum, thickness of ventricular myocardium, auricle etc.) 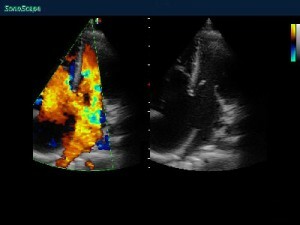 the presence and the volume of fluid in the pericard – “pericardial sac”, the state of the valves. The ultrasonic examination is used for examination of the internal female genital neoplasms, the state of the gravid uterus, anatomy and monitoring of the Embryo-fetal development. 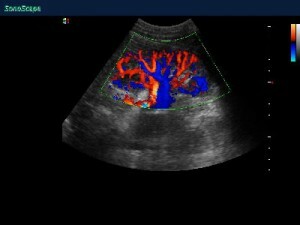 The number of fetuses and the death of the fetus can be detected with the help of ultrasound examination. The ultrasonic examination is used to detect traumatic injuries and inflammatory disease of joints (shoulder, knee, etc. ), muscles, bands, meniscus, chorda, arthrosis.